Home » The community of Manuel A. Pérez received training in the use of family and community water filters. The community of Manuel A. Pérez received training in the use of family and community water filters. Representatives of the community including the director of the Nursing Center, the recreational leader, social worker, administrator, maintenance workers, church members, and residents participated in the training. Mr. Héctor Torres, a student of health education and Professor Carmen M. Vélez of the Medical Sciences Campus demonstrated the use and proper handling of the filters. The activity was organized by pilot project investigator, Dr. Deborah Juarbe. 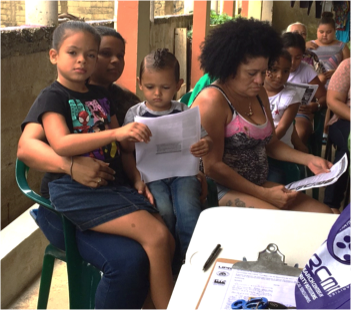 As part of the pilot project “Risk Communication and Community Engagement Strategies to Enhance Behavior Change for Zika Virus Prevention and Control”, Dr. Deborah Juarbe organized an activity focused on how to prevent the transmission of the Zika virus at home. The activity was held at Villa Calma Sector in Toa Baja, P.R., a community severely affected by hurricane Maria. Dr. Carmen Vélez and Mr. Héctor Torres, from the Puerto Rico Testsite for Exploring Contamination Threats (PROTECT) program, collaborated in the activity. Mr. Torres explained to the 40 participants how to protect their homes and neighborhood from mosquitoes. Mosquito nets and repellents were distributed at the end of the activity. Dr. Juarbe distributed printed material related to the Zika virus infection and gave special thanks to Ms. Millie Chévere for assisting in the organization and execution of the activity.